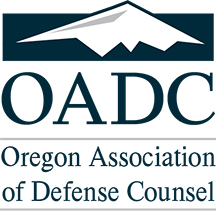 OADC Regular Membership is for active attorney members of the Oregon State Bar who devote a substantial portion of their practice to representing the interests of individual defendants, businesses, insurance companies, or government entities in civil litigation. Membership dues are $190 for the first year of annual dues, and after the first year of annual membership, annual dues are $290. Membership dues for those practicing their first three years of law are $240.